Last week, Dr. Colin Sprigg, Director of Information and Technology in the ABC Unified School District and I strategized ways to respond to the new social media app called Ogle. We learned that ABC Unified School District along with schools from throughout California, faced a new problem caused by Ogle which targets high school and college students. Ogle allows users to make anonymous posts under a selected school name. Users can post anything on Ogle using text, photos, and videos. As a result, some Ogle user’s sense of anonymity, posts have targeted specific schools and students with abusive and hurtful content. The Ogle app’s user anonymity makes it difficult for school officials to quickly investigate issues that occur within the Ogle app. Last week, one particular post targeted Cerritos High School with a threat to school safety. This post caused Cerritos High School administrators and the Cerritos Sheriff’s Department to act swiftly before it was determined that the threat was a hoax. ABC District staff have been closely monitoring Ogle postings in response to recent events. The campus specific posts range in nature from harassment, bullying, sexual content, false statements, and threats. A review of recent news articles from around the State of California, show that other school Districts have scrambled to investigate specific Ogle posts considered to be unlawful due to the threatening nature of the content. Ogle users need to know that nothing posted on online is ever anonymous. While Ogle users have a sense of anonymity, behind the scenes Ogle is collecting device information from every post made to their site. This device information may be subpoenaed by law enforcement and tracked back to the account holders of a device in question. Our District will work closely with the Cerritos Sheriff Department to subpoena identifying mobile device information associated with any posts determined to be unlawful or a threat to school safety. A number of other California school districts recently in the news, have successfully subpoenaed mobile device information from Ogle that were determined to have been the source of specific threats to schools, each resulting in arrests in the cities of Anaheim, Orange, and Santa Cruz, CA. Dr. Colin Sprigg states that our school administrators are closely monitoring Ogle posts, and that a variety of mitigations are in place to counter this new problem. “First, everyone should know that access to Ogle is blocked on the ABC Network for students and staff. Ogle is not accessible via our schools’ Wi-Fi or via any school owned student devices.” Dr. Sprigg indicated the Ogle problems are occurring on students’ personal smart phones, which cannot be monitored or controlled by the school district. Prominent parent alerts are on the District and ABC High School and Middle School websites. The alerts inform parents about the Ogle problem in schools, and recommend that parents intervene and eliminate the Ogle app from their students’ cell phones. In addition, the parent alert encourages parents to visit the District’s CyberSmart website where grade level teaching materials are available for teachers and parents to review appropriate, safe, and respectful online behaviors expected from ABC students. These materials are part of the District’s annual CyberSmart month that occurs each October at all ABC Schools. In response to the Ogle problem, the District is creating a specific CyberSmart lesson intended for ABC’s Middle and High School teachers and students. The new lesson will specifically address the dangers of anonymous social media Apps like Ogle, and it will be delivered to all secondary schools in the near future. 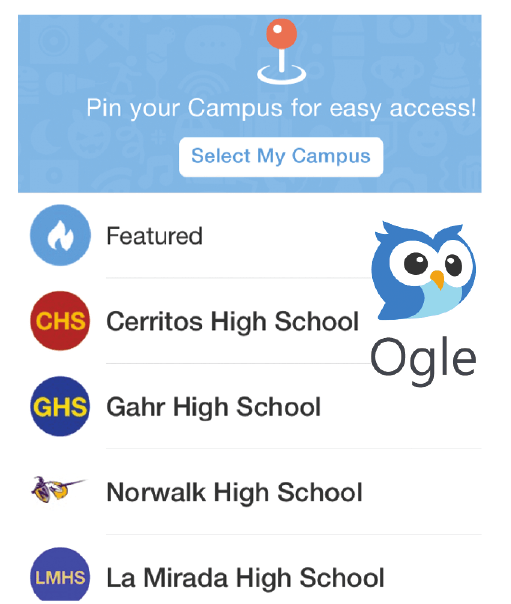 School districts in California have obviously not endorsed the Ogle app, nor have they granted Ogle the right or permission to use their schools’ names within Ogle application. The District has made a written request to Ogle to delete all ABC school names. Ogle has not responded to the request. There is mounting legal discussion occurring within the education community against Ogle which the ABC Unified School District is closely monitoring.